Like most sports, the goal of girls lacrosse is to score more points than your opponent in order to win the game. Girl’s lacrosse is played with twelve players per team on the field; 1 goaltender, 4 defensemen, 3 midfielders, and 4 attackers. Though the game shares similarities with boy’s lacrosse, girl’s lacrosse is a much more finesse and skill-laden game due to the lack of physical contact between players. The game is dictated by scoring goals in your opponent’s net, which can be achieved in a different number of ways through different offenses and penalties. The game is played at many different levels of skill, from youth to college, and even semi-professionally. It is an ever-changing game, as the skills and talents of players expand; the game is constantly updated by USLacrosse, the governing body for lacrosse in the United States. These changes and additions allow for growth of the game. The space allotment for a girl’s lacrosse field has some variance, depending on each site’s field. Current USLacrosse rules state that a girl’s lacrosse field must be between 110 and 140 yards long and 60 to 70 yards wide. The goals should be placed no less than 90 and no more than 100 yards apart on the field, with at least 10 yards of space behind each goal. Placed on the field are a series of lines, native only to girl’s lacrosse and completely different than boy’s lacrosse. In the center of the field, there is a draw circle. The diameter of the draw circle is 60 feet. Inside the center of the draw circle, there is another line marking exactly half of the field. This line is where the draw takes place. Like a faceoff in boy’s lacrosse, a draw occurs after every goal scored, and to begin every game and second half. 30 yards up from each goal line where the goals are placed, are the restraining lines. Restraining lines are placed on the field for two reasons: One, all other players besides three midfielders per team must be behind the restraining lines when a draw occurs. Two, a restraining line is used to mark the offensive and defensive zones. Each team may have 7 players in their attacking zone, but 8 in their defensive zone, (7 field players and a goaltender.) Teams must hold four players behind the restraining lines when in the attacking and defending zones, or they are committing an offside foul and can be penalized. In each attacking zone, there is a 12 meter arc and an 8 meter fans. The 12 meter arc extends from the goal line up to 12 meters in front of the goal, and back around to the opposite side of the goal line. The 8 meter fan extends from the goal line and intersects with the goal circle. There are also hash marks on the 8 meter for free position penalties. The goal circle encompasses the goal, and has an 8 ½ foot diameter. Inside is the goal, which is a 6 x 6 square made up of metal pipes and netting. The entire field is kept in by sidelines and end lines, referred to as “hard boundaries.” A hard boundary in girl’s lacrosse means that if the ball or player with the ball goes out of bounds, it is treated as a minor penalty, and the ball is given to the non-offending team. The game must be played within the boundaries and players cannot use space outside the sidelines or end lines to play. Girl’s lacrosse is played with sticks that must meet specifications in order to be designated as legal. Most common manufacturers, like Nike, DeBeer, Brine, and STX, ensure their designs meet all rules specified for players. The sticks must be between 35 ½ and 43 ¼ inches, and the pocket of the stick must allow for the ball to be seen over the side rail of the head. There are other specifications that allow for a certain number of strings and leathers, but every stringing is a little bit different. Girl’s participating in lacrosse must also wear ASTM approved eyewear in protective goggles. A mouth guard that must be any color other than clear has to also be worn while playing. Field players can also wear protective gloves. A goaltender in girl’s lacrosse has different specifications for necessary equipment since they are jumping in front of shots. They must wear a NOCSAE approved lacrosse helmet, a throat guard, chest protector, gloves, thigh pads, and shin guards. A goaltenders stick must be between 35 ½ and 52 inches long, with pockets rarely being illegal. The girl’s game is separated into halves, with a set amount of time each half and halftime. High school participant’s normally play 40-50 minute games, with halves of 20 or 25 minutes. The college game is played with 30 minute halves. Time does not stop when the whistle blows in most situations unless indicated by the official for an injury, a timeout, a card, or after goals. The team with the most goals at the end of the designated game time wins. If tied, many teams will continue to play periods of three minute overtimes. Like a faceoff in boy’s lacrosse, two players meet in the middle to take a draw after goals and the start of the game and half. Girl’s lacrosse draws are taken by placing the ball between the backs of two player’s sticks, one player from each team. On the officials whistle, the draw takers lift the sticks over their head in a quick motion, releasing the ball and allowing both teams to fight for possession of the ball. Upon taking possession, the teams can then bring the ball into the attacking zone and try to score. Strategy of girl’s lacrosse delves deep into many different options of both offense and defense. Like most sports, there is the option, when in possession of the ball, to take it straight to the goal and try to score off the draw. This is referred to as a “fast break.” Attacking teams can also choose to “settle” the ball, pass it from teammate to teammate, and look to score off of options and set plays. Defenses can also be played with the best options in mind, and can go from zone to man-to-man and different variations of the two. More options and strategy comes with age and experience in the game. 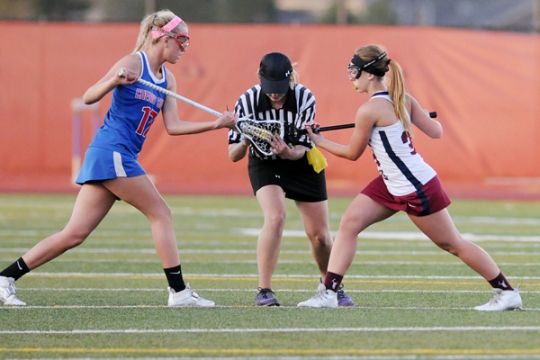 Fouls are a large part of the girl’s lacrosse game. Players that commit a foul during the game will cause the game to stop on the officials whistle, and everyone on the field must freeze, or “stand.” This allows for no disadvantages to either team. There are team fouls and individual fouls, as well as cardable fouls. Major fouls, usually dangerous to players, can be cardable. Receiving a card means a player will have to leave the game for 2-4 minutes, depending on the severity of the card. Major fouls include blocking, checking within the sphere, dangerous shot on the goalkeeper, illegal procedures, offensive fouls, goal circle fouls, pushing, illegal cradles, holding, illegal stick on the body, obstruction of free space to goal or shooting space, rough check, three seconds, tripping and warding. Cardable offenses being the most serious can be any variations of player or coach misconduct, delay of game, slashing, check to the head, dangerous propel, and any repeated dangerous action the official deems necessary to card. Minor fouls include checking the empty stick, and covering. Though it may seem like a lot of penalties and fouls, when the game is played fairly and safely, the outcome is better dictated by the players than it is by the officials. As young players learn the game, the whistle is blown more due to the need to teach appropriate skill and procedure. Once skill and knowledge is obtained throughout a player’s career, the game flows more smoothly with less need of dictation by the official.